My three-year-old is really into this game. It is a great way to start our morning off because he is always excited about playing "stipture powder". A few weeks ago he took to carrying his scriptures around EVERYWHERE and wouldn't go to sleep unless his "scripture power" was tucked in next to him. It was pretty cute. Lately my 14 month-old has been getting into this song as well. Every morning when my husband mentions scriptures she will run over the shelf where we keep the scriptures, pulls one out and run to climb up on the couch. She has even started to try to sing along in a screechy voice and giggles uncontrollably as she holds her scriptures up. It is fun to see her already excited about scriptures! They don't listen at all while we read the scriptures but at least they are excited about getting them out. It is a step in the right direction, right? Yep, I have been there. I promise that if you continue to read, they will listen as they get older. It is easier on them when they can read along. I have also used the children's scripture stories to talk about the different stories in the scriptures. They love those and they have pictures, so they get to "help" read along. When the girls were little, they would read through their "scriptures" while we were reading and than we would go over one of the stories with them so that they had a fun time. Today, they all read along with us, they get up without complaining, and not one of them would consider going out the door without scripture study to start the day. You are going in exactly the right direction. Such a cute idea! Thanks for sharing. I read the scriptures with my kids as part of their bed time stories. They each get to pick one book and then we read from the Book of Mormon or the "Jesus book" as my three year old calls it. We each "read" a verse. I start out by reading one verse and then I have each of them repeat a verse each after me. 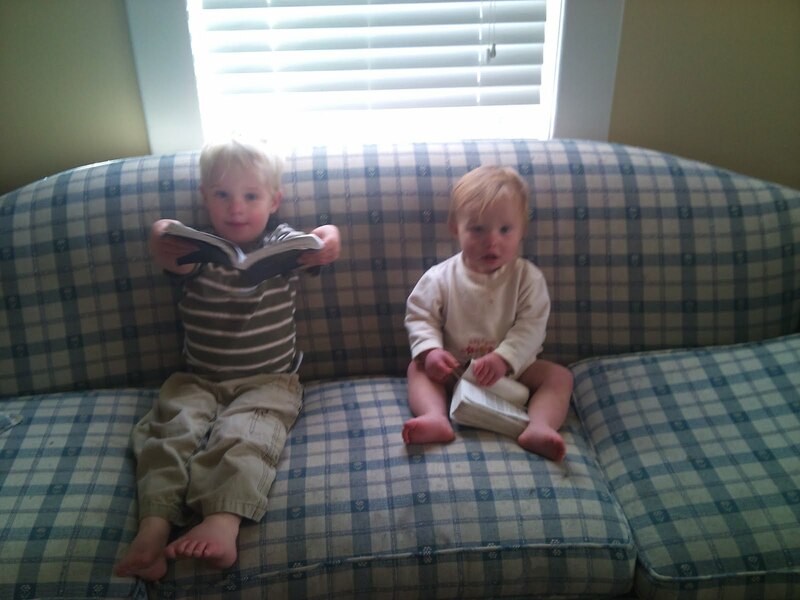 They both love it, and repeat the verse even if they are still looking at the other books we read before (at least the words are getting into their heads). As we pick out the books we'll read each night, my four year old will say "... and the Book of Mormon." And my three year old starts saying even before I read anything for her to repeat "and it came to pass ..." it's so cute! I think what you are doing is great, too. By doing these small things the kids will learn the importance of the scriptures and that they are part of our every day lives. you are doing great! yep- your doing it right! Thanks for the encouragement! Ailinh, wow you get lots of extra bonus points for doing scriptures by yourself. I don't know if I'd have the motivation to do it if I didn't have a hubby who was so good about doing it. So impressive! Cute! My kids would love to sing that before studying too! Oi Heather...passe no meu blog www.sociedadedesocorrovirtual.blogspot.com Tem um selinho bem especial para amigas especiais como você! very clever idea, I think this would work with even older children. The concept is so sweet and simple just like the gospel. This is precious. I love that photo of your little ones on the couch. Someone once mentioned the notion of children's ability to learn languages when they are young, and I think that is yet another reason to do scriptures with children (including from the scriptures themselves...not just picture books, etc.) because they become comfortable with the language of the scriptures. I am consistenly amazed by how much my children grasp -- more than I ever did, sometimes even at twice their age! I'm new to your blog. (I found your link at Super Healthy Kids) I absolutely LOVE this. We are not members of the LDS church, as i married into the Church of Christ. This is such a wonderful idea. I'm always struggling to get my husband to be a spiritual leader in our home. I also struggle with how to teach my children...my son will be 5 in April, and my daughter just turned 2.
i really like this idea. thanks for sharing.